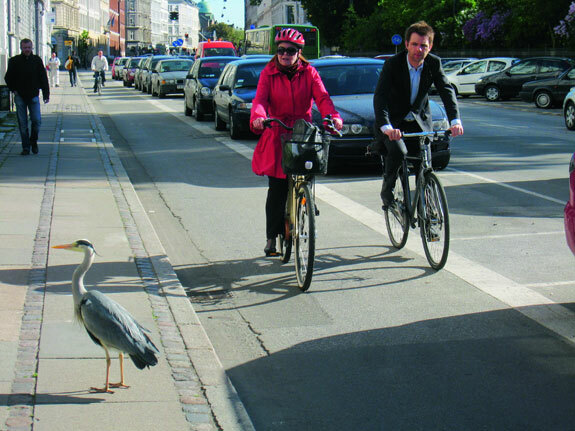 Editor’s note: Streetsblog is thrilled to launch a three-part series today by renowned Danish architect and livable streets luminary Jan Gehl. The pieces are excerpts from his book, “Cities for People,” published by Island Press. Donate to Streetsblog and Streetfilms and you’ll qualify to win a copy of the book, courtesy of Island Press. Visit the Island Press website to find many more great titles by the nation’s leading publisher of books on environmental issues. Feeling safe is crucial if we hope to have people embrace city space. In general, life and people themselves make the city more inviting and safe in terms of both experienced and perceived security. In this section we deal with the safe city issue with the goal of ensuring good cities by inviting walking, biking and staying. Our discussion will focus on two important sectors where targeted efforts can satisfy the requirement for safety in city space: traffic safety and crime prevention. Throughout the entire period of car encroachment, cities have tried to remove bicycle traffic from their streets. The risk of accident to pedestrians and bicyclists has been great throughout the rise in car traffic, and the fear of accident even greater. Many European countries and North America experienced the car invasion early on and have watched city quality deteriorate year by year. There have been numerous counter reactions and an incipient development of new traffic planning principles in response. In other countries whose economies have developed more slowly and modestly, cars have only begun to invade cities more recently. In every case the result is a dramatic worsening of conditions for pedestrians and bicycle traffic. The concept of shared or complete streets suggests equality between traffic groups, which is a utopian ideal. Integrating various types of traffic is not satisfactory until pedestrians are given a clear priority (shared space in Haren, the Netherlands, and a pedestrian priority street in Copenhagen, Denmark). In cities where the car invasion began early and has lasted decades, we can now see a strong reaction against the myopic focus on cars that has dealt such harsh blows to city life and bicycle traffic. In many countries, especially in Europe, traffic planning in the 21st century has changed dramatically compared to the traffic planning of twenty or thirty years ago. The importance of promoting pedestrian and bicycle traffic has gradually been acknowledged while better understanding of the nature and causes of traffic accidents has produced a considerably wider variety of planning tools. When the first pedestrian streets were introduced in Europe in the 1960s, there were really only two street models: those for vehicular traffic and those for pedestrians. Numerous types of streets and traffic solutions have since been developed so that today’s traffic planners have quite a wide range of streets to choose from: vehicular traffic-only streets, boulevards, 30 km/h (19 mph) traffic, pedestrian priority, 15 km/h (9 mph) areas, pedestrian-streetcar, pedestrian-bicycle and pedestrian only. The experience gained in the intervening years has also made it possible to reduce the number of traffic accidents and make walking or biking considerably safer and more comfortable. In choosing street types and traffic solutions, it is important to start with the human dimension. People must be able to move comfortably and safely in cities on foot or by bicycle, and when traffic solutions are adopted special consideration must be given to children, the young, the elderly and people with disabilities. Quality for people and pedestrian safety must be key concerns. The underlying idea of these so-called shared streets is that they will give trucks, cars, motorcycles, bicycles and pedestrians of all ages the opportunity to travel quietly, side by side and with good eye contact. Serious accidents will rarely occur under such conditions, or so it is thought, because pedestrians and bicyclists need to be extra vigilant at all times. Obviously, if people are sufficiently frightened and keep a close watch on traffic, nothing untoward will happen. However, the price is high in terms of dignity and quality. Children cannot be allowed free rein, and older people and others with reduced mobility may be forced to drop walking altogether. In any discussion about people and traffic safety the risk of accident must be weighed against quality for pedestrians and bicyclists. Much of modern traffic planning continues to pay far too little attention to the quality of city life. Mixing types of traffic is certainly possible, but not on the equal terms implied by the shared street concept. 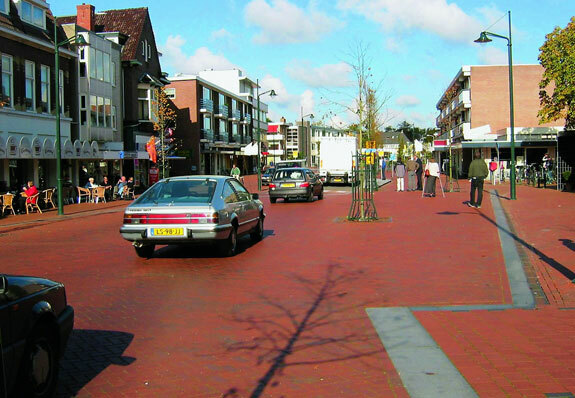 As the British “home zones,” Dutch “woonerfs,” and Scandinavian “sivegader” have demonstrated for years, pedestrians can thrive with other forms of traffic as long as it is crystal clear that all movement is based on the premises of pedestrians. Mixed–traffic solutions must prioritize either pedestrians or provide appropriate traffic segregation. Copenhagen-style bicycle lanes take advantage of parked cars to protect bicyclists. 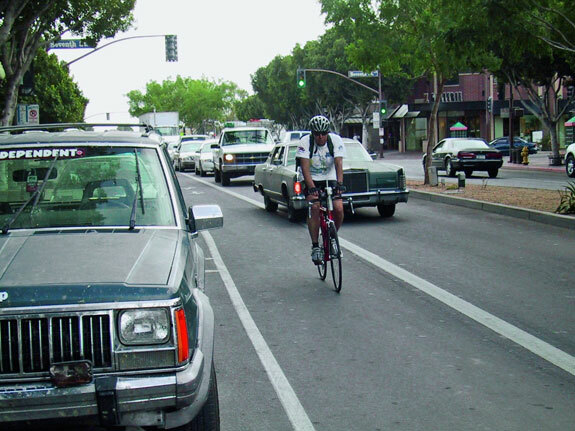 The principle of having bicyclists bike outside a lane of parked cars does not solve many safety and security problems. It does help to protect the parked cars, however! There is every reason to applaud the many new types of streets and policies that ensure safety for pedestrians and bicyclists while allowing service vehicles to make door-to-door deliveries. From project to project, planners must consider which types of streets and degree of traffic integration would be a good solution. The actual and perceived safety of pedestrians must always be the determining factor. It is not a natural law that motorized traffic should be allowed access everywhere. It is generally accepted that cars are not welcome in parks, libraries, community centers and houses. The advantages to not having car traffic everywhere are obvious, so even though there are compelling arguments for allowing car traffic all the way to the front door, in many situations there are equally good arguments for establishing car-free areas surrounding the residences. For centuries traffic in Venice has functioned on the principle that the transition from rapid to slow traffic does not take place at the front door but at the city limit. 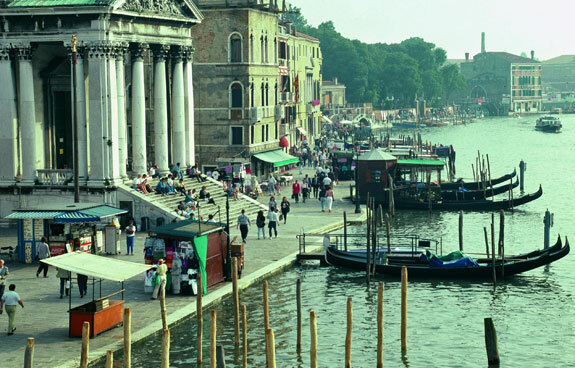 The Venice principle is hard to beat when prioritizing city quality. As mentioned above, a number of options have been developed for coexistence between pedestrian and motorized traffic. While these options open new doors, they also create more problems. A pedestrian in Venice can be forgiven for thinking that many of the recent traffic solutions represent various forms of compromise compared to the vision of a true city for people. Or put in another way, in Venice it is easy to surmise that “there is only one thing better than slow cars — and that is no cars.” But as also mentioned, it is important to be pragmatic and flexible. There are many good new compromises, but they must be assessed and carefully selected. In Venice the shift from rapid to slow traffic occurs at the city limits rather than at the front door. This is an interesting and inspiring for the contemporary vision of creating lively, safe, sustainable and healthy cities. Already in the first chapter of her 1961 book, The Death and Life of Great American Cities, Jane Jacobs discusses the importance of safety in the streets. She describes the crime-preventive effect of life in the street, of mixing functions in buildings and of residents’ care for common space. Her expressions “street watchers” and “eyes on the street” have since become integral to city planning terminology. Being able to walk safely in city space is a prerequisite for creating inviting well-functioning cities for people. Experienced as well as perceived safety is crucial for life in the city. The safety discussion has a general and a more detailed dimension. The general focus is maintaining and supporting the vision of an open society in which people from all socioeconomic groups can move about side by side in the common room of the city as they go about their daily business. Within this general framework, safety can also be promoted through careful consideration for the design of the many detailed solutions in the city. Juxtaposed with the idealistic visions of safe open cities is the reality of many urban societies. Social and economic inequality is the backdrop for high crime rates and the fully or semiprivate attempts to protect property and private life. A profusion of bars, fences, signs and cameras signals the insecurity and fear that have crept into communities around the world. Barbed wire and iron bars fortify houses, security patrols cruise residential areas, security guards stand in front of shops and banks, signs threaten “armed response” outside houses in exclusive quarters, gated communities abound: all of these are examples of people’s attempts to protect themselves against invasion and trespass of private property. The examples also illustrate a general retreat to the private sphere by some population groups. 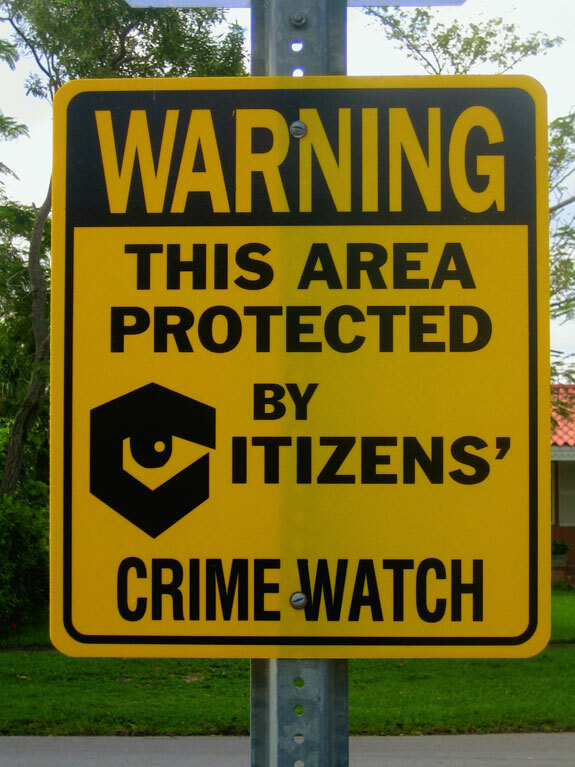 It is important to point out that simple individual urban crime-prevention solutions are not of much help, where the invasive sense of insecurity is often deeply rooted in social conditions. On the other hand, many urban communities are less gridlocked, including hard-hit city districts. In these areas there is every reason to make a solid effort to avoid the retreat of the population behind bars and barbed wire. Other parts of the world do have cities and societies in which cultural tradition, family networks and social structure keep crime low despite economic inequalities. To conclude, in almost all situations there are good arguments for working carefully to reinforce real and perceived safety, a prerequisite for using common city space. If we shift the focus from defending the private sphere to a general discussion about feeling safe while walking in public space, we will find a clear-cut connection between the goal to strengthen city life and the desire for safety. If we reinforce city life so that more people walk and spend time in common spaces, in almost every situation both real and perceived safety will increase. The presence of others indicates that a place is acceptly good and safe. There are “eyes in the street” and often “eyes on the street” as well because it has become meaningful and interesting for people in nearby buildings to follow what is going on in the street. When people make their daily rounds in city space, both the space and the people who use them becomes more meaningful and thus more important to keep an eye on and watch out for. A lively city becomes a valued city and thus also a safer city. Life in the street has an impact on safety, but life along the street also plays a significant role. Urban areas with mixed functions provide more activities in and near buildings around the clock. Housing in particular signifies good connections to the city’s important common space and a marked reinforcement of the real and perceived safety in the evening and at night. So even if the street is deserted, lights from windows in residential areas send a comforting signal that people are nearby. Approximately 7,000 residents live in Copenhagen’s city center. On an ordinary weekday evening in the winter season a person walking through the city can enjoy the lights from about 7,000 windows. The light from buildings along city streets can make a significant contribution to the feeling of security when darkness falls. 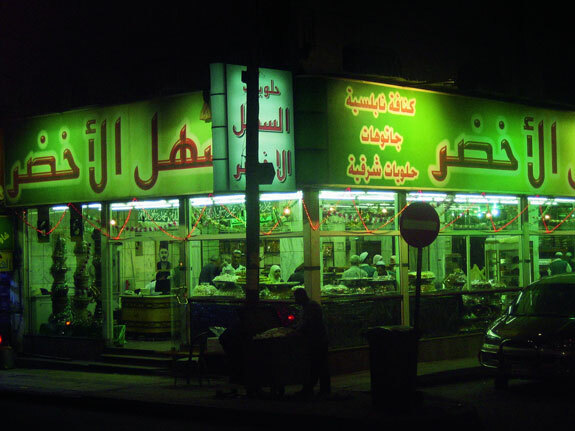 Above: Bakery in Amman, Jordan. 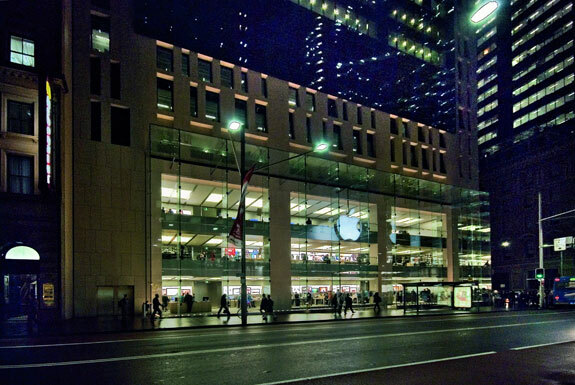 The Apple Store in Sydney, Australia. 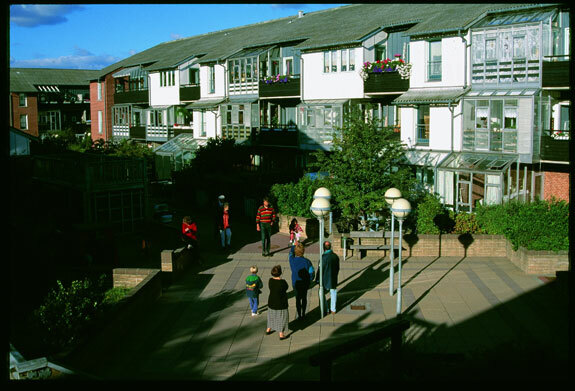 The proximity to housing and residents plays a key role in the feeling of safety. It is common practice for city planners to mix functions and housing as a crime prevention strategy and thus increase the feeling of safety along the most important streets used by pedestrians and bicyclists. The strategy works well in Copenhagen, where the city center has buildings between five and six stories high, and there is good visual contact between residences and street space. The strategy does not work as well in Sydney. Although the Australian metropolis has 15,000 people living in its heart, the residences are generally from 10 to 50 stories above street level, no one who lives high up can see what is happening down on the street. 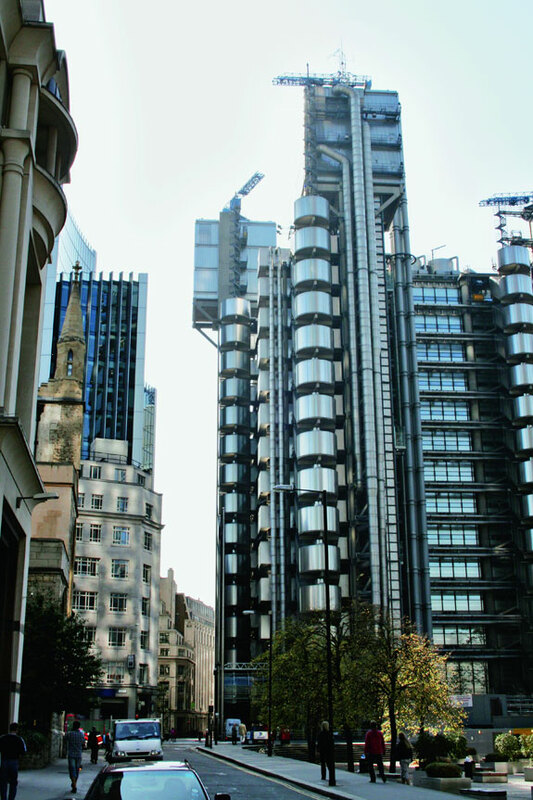 Tall buildings can also land softly and elegantly along streets and soften the transition between out and in (Lloyd´s of London. Architects: Richard Rogers Partnership, 1978 - 86). Ground floor building design has a disproportionately large impact on the life and appeal of city space. Ground floors are what we see when we walk past buildings. It is also from the lower floors that people inside can follow what is going on outside, and vice versa. If ground floors are friendly, soft and — in particular — populated, pedestrians are surrounded by human activity. Even at night when little is happening in cafés and front yards, furniture, flowers, parked bicycles and forgotten toys are a comforting witness of life and proximity to other people. Light streaming from the windows of shops, offices and dwellings at night helps increase the feeling of safety in the street. Soft edges signal to people that a city is welcoming. In contrast, in streets with retail, where solid metal shutters close off shops outside opening hours a sense of rejection and insecurity is produced. The streets are dark and deserted in the evening, and there is not much reason to be there on weekends and holidays either. Given the general desire for safe cities and inviting ground floors, preferred façade options have open metal grills and other types of transparency to protect goods but allow light to stream onto the street, and they also give nocturnal pedestrians the pleasure of window shopping. Life in the street and on the street, mixed functions along the street and friendly edge zones are key qualities for good cities — also in terms of safety and protection. The polar opposite is the perfect recipe for an insecure urban environment: lifeless streets, mono-functional buildings devoid of activity for most of the day, closed, lifeless and dark façades. To this list we can add insufficient lighting, deserted paths and pedestrian tunnels, dark nooks and crannies, and too many bushes. In the face of this rather depressing scenario it is important to remember that almost any enticement to invite people to walk, bicycle and stay in city space will also contribute to a greater sense of security. 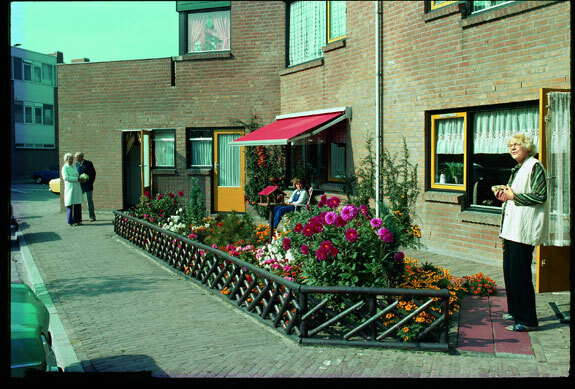 A soft edge and clear distinctions be- tween public, semiprivate and private territories provide good opportunities to signal where you live and decorate it with your favorite flowers (Almere, the Netherlands). Another contribution to our sense of security is a good city layout that makes it is easy for us to find our way around. It is a mark of good urban quality when we can directly find the destination we’re looking for without hesitation and detours. Clear structure and organization do not require large dimensions and broad straight roads from point to point. It is fine for the streets to be winding and the street network varied. What is important is that the individual links in the network have clear visual characteristics, that space has a distinctive character and that important streets can be distinguished from less important ones. Signs and directions and good lighting at night are crucial elements of the relationship between city structure, sense of locality and feeling of security when walking in the city. In the chapter on human senses, it was mentioned how different distances are used for various types of communication between people, and how these distances are continuously used to reinforce the character and intensity of contacts. Interacting with others and protecting our private sphere are two sides of the same coin. Just as close contact necessitates precisely defined territories, a clear articulation of private and public territories on the larger arena is an important prerequisite for social opportunities and a sense of security. Human society is subtly organized around various social structures that define and reinforce the individual’s sense of affiliation and security. A university student is part of a structure with faculties, departments, classes and study groups that provide a framework. Workplaces have divisions, departments and teams. Cities have quarters, neighborhoods, housing complexes and single dwellings. Coupled with well-known designations and signals, these structures in themselves help reinforce a sense of affiliation within the larger entity and security for the individual group, household or person. Also on a small scale — particularly in connection with individual dwellings — clarifying territories and affiliations is crucial for contact with others and for protecting the private sphere. Whereas efforts are made to graduate and soften transitions between private and public areas by building semiprivate and semipublic transition zones, the likelihood of contact from zone to zone increases, and residents gain the opportunity to regulate contacts and protect private life. A well-proportioned transition zone can keep events at a comfortable arm’s length. In the previous section soft edges and their importance for life in the city are discussed. It is emphasized that edge zones, porches and front yards can make a decisive contribution to vitalizing life in public space. These transition zones between the private and public sphere must be carefully articulated in order to clearly distinguish between what is private and what is public. Changes in pavement, landscaping, furniture, hedges, gates and canopies can mark where public space ends and fully or semiprivate transition zones begin. Height differences, steps and staircases can also mark the transition zone, providing critical prerequisite for the important function of soft edges as the link between inside and out, between private and public. Only when territories are clearly marked can the private sphere afford the degree of protection that people need to make contact with others and contribute to life in the city. Pedestrian and bicycle traffic save a lot of space in the city. 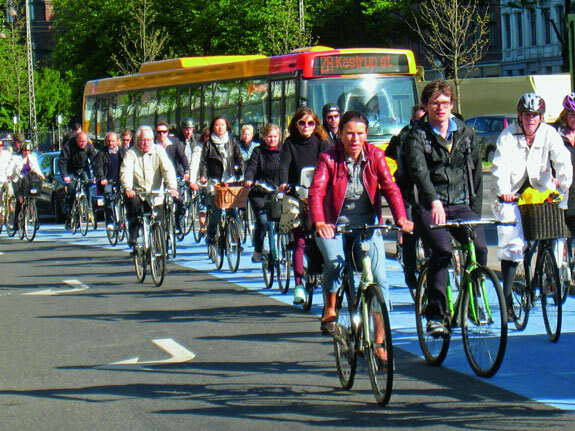 Bicycle paths have room for five times more traffic than car lanes. The sidewalk has room for 20 times more travellers than car lanes. Very informative and persuasive, I would just ask that those comforting lights in the city point down only – already far too much light pollution in the sky. Does any one know of a public library where his first book is kept for reference? It’s never available at 42nd Street and very expensive to buy, even on Amazon. Tom, search the nypl.org website. If it’s not designated as USE IN LIBRARY, you can have it sent to your local branch with PLACE HOLD. The part of me who enjoys reading well-written things I agree with is tempted to check this book out, but the cynic in me says that I’ve already read “Death and Life of Great American Cities” and is unsure what this “reprise” has to offer. I love this series. I love Jan! I love Streetsblog?! This is like the Reeses peanut butter cup of livable streets. Probably the single most common complaint by the anti-livable streets people, in particular anything that hinders private car usage in any way (bike lanes especially but also things like congestion pricing and taxing gas), is that it undermines “the American way”. This meme pops up with tiresome regularity whenever livable streets initiatives come up in the public debate. They equate car usage with personal freedom. There’s an obvious freedom one has with a car to literally drive wherever you want, but I think there’s more. The typical American idea of freedom is a freedom *from* something, not a freedom *for* something. It’s a negative view of freedom – the freedom from being unjustly imprisoned, or prevented from going where they want to go when they want to go there. Freedom is almost never envisioned as positive freedom – the freedom of an elderly person, or a child, to travel their city safely for example. Maybe this is why cars are so detrimental to our social commons – the space we all share – because it privileges personal rights over the public good in the same way that cars privilege personal freedom over public freedom. How about framing it as the freedom from being obligated to take a car every place you want to go? Ha ha! You mean Isaiah Berlin? I just wiki’d him. I’m sure whoever I got these concepts from eventually went back to him. It’s interesting the thinkers Berlin categorizes with negative freedom (or negative liberty as he puts it) are associated with capitalism and/or democracy (John Locke, David Hume, John Stuart Mill, deTocqueville) I’m sure that means something – America is the land of laissez faire capitalism taken to almost religious extremes.